I am slightly obsessed when it comes to buying baby gifts. 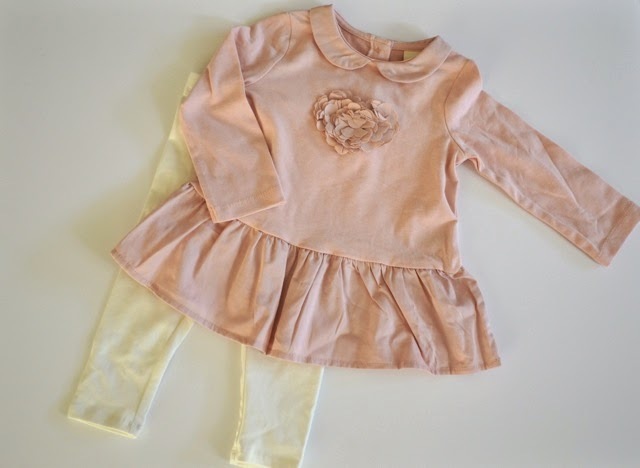 Fashion in miniature is hands down one of the most adorable aspects of baby gift giving! 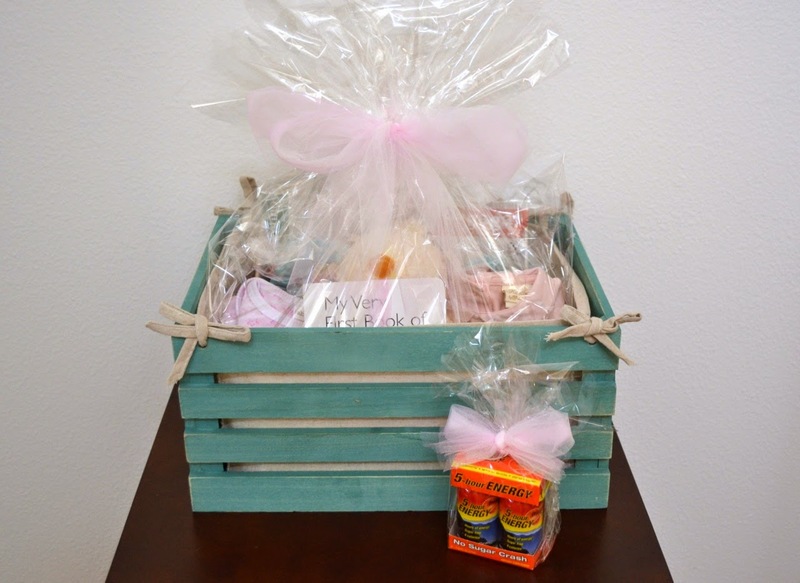 This post focuses on the co-worker or acquaintance that's having a baby. You usually don't know them as well as a bestie so putting in uber personal touches is a bit more difficult. 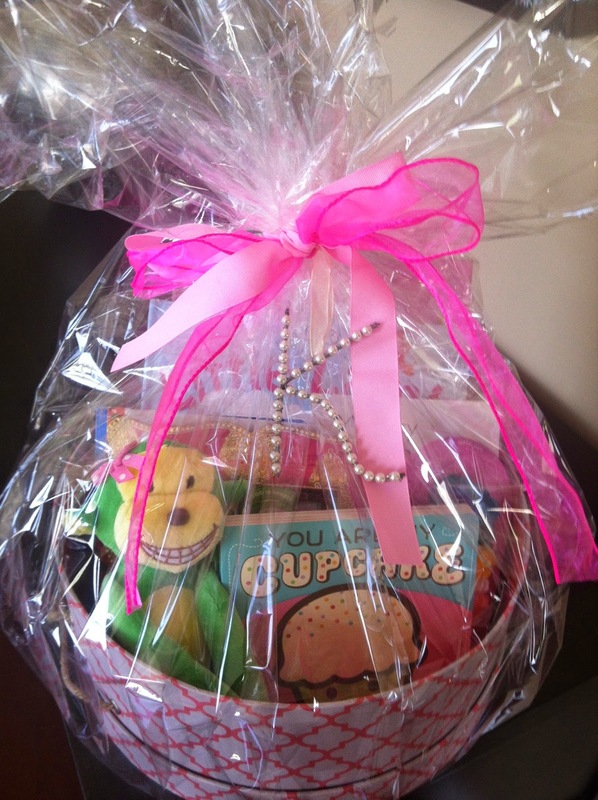 However, creating a special and fun gift for their impending arrival is easy! One of my favorite places to go is T.J.Maxx. You can score so much more when you have a budget to stick to while creating a complete and perfect gift! 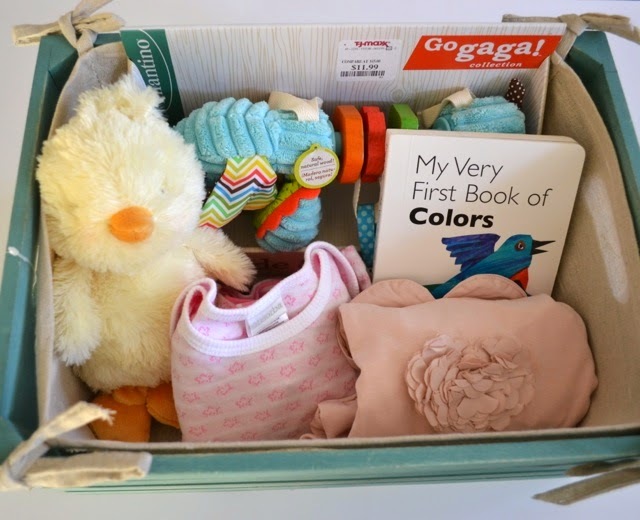 Instead of wrapping or gravitating to the good ol' stand by of a gift bag, buy something that the parents can re-purpose in the baby's nursery. I found this wooden crate for $9.99. I'm not sure of their nursery's color scheme, (this is for a co-worker of my fiance's) but I choose a neutral color that could just as easily be stored in the baby's closet to hold toys or books. 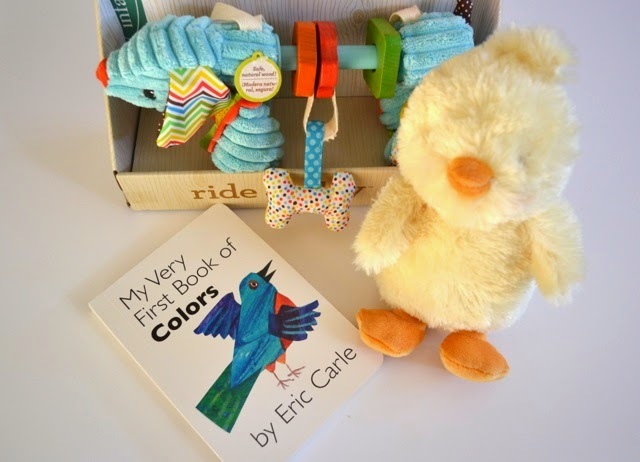 I always like to include a toy, it just adds some whimsy and sweetness to any gift. This Bunnies by the Bay chickie was only $4.99, they generally retail at boutiques for much more. Always pick up a book, after all, reading is fundamental! When one of my dear friends had her baby shower I took it a step further and tracked down my favorite book from my childhood (which they still print!) and wrote a personalized note to her sweet little munchkin. If you're going to buy clothes, size up! Likely the parents are well stocked on newborn gear and you never know if this baby might weigh-in a little above average. I like to buy a neutral blanket and an outfit, however this time I went with two outfits instead. 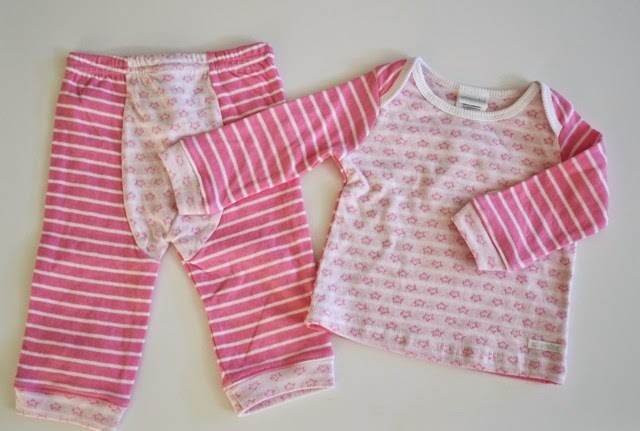 Absorba is one of my fave brands for the littles- super cute and great quality! A little something for the Dad-to-be! Every part of my outfit was one kind of a bargain or another. My top from Anthropologie was a clearance rack score during the "take an additional 20% off--how can you say no sale." I have always been a big fan of the layered look and when it comes as one piece- I say thank you for not making me struggle with fitting a tight sweater over a bulky button-down- whew! Next up on this OOTD: distressed, torn and patched denim from American Eagle. Let's just say I haven't stepped foot in one since college and boy did I feel out of place. That being said, I mustered up the confidence to get what I came for, some truly fab jeans at an amazing price ((plus with tunics no one would know where I got them from-- until now)). My lace-up faux suede wedges are from the forever addicting Hautelook for only $18! I linked two similar pairs in the caption above. Oh and in case you were wondering, I kicked the Hautelook habit back in February. I grabbed my scissors for a little DIY to these jeans. I appreciate the modesty of the patches but wanted a little more skin exposure, so I cut out some of the patches to get the desired look. I didn't hesitate with the shears because these jeans were 1. under 30 bucks and 2. they were already "destroyed". This adorable vintage Louis Vuitton Speedy was a consignment score at a fraction of the original retail. Re-sale is a great way to procure the designer handbag of your dreams on a budget. Just be sure that you've done your homework on the brand and are purchasing from a reputable shop. Nobody likes a fake. Check out this article by Forbes on details to look for when purchasing a designer bag second hand. It pays to be an informed fashionista! On a recent visit to my Aunt's house (BTW she's an amazing baker)- she shared with me some of her Homemade Strawberry Jam. Then she told me it was EASY! Now that I'm back home and we recently purchased some beyond delish strawberries, I just had to try it. 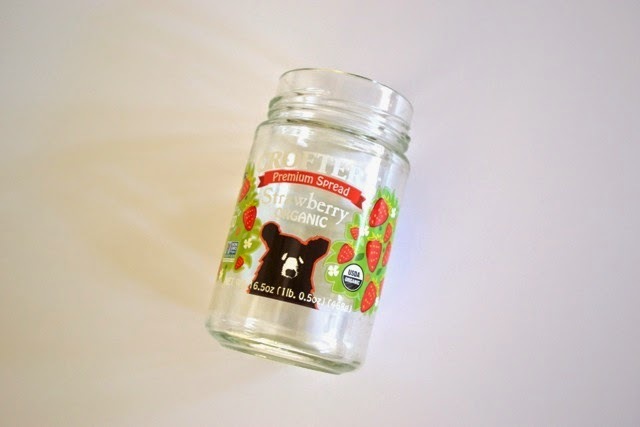 Oh, and I ran out of my fave Crofter's Organic Strawberry AM essential. 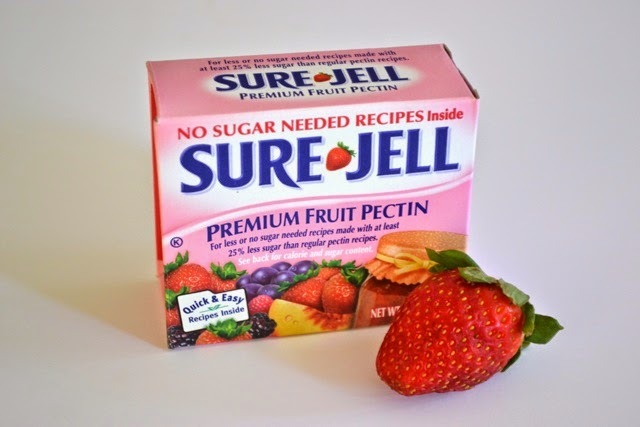 My Aunt recommended the less sugar version of pectin- which these strawberries were already naturally sweet, so it made sense. 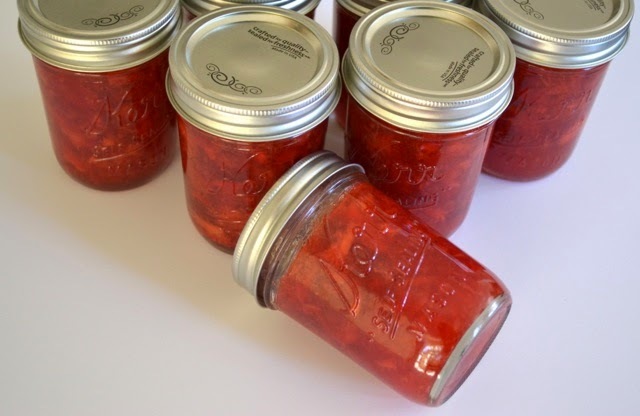 What you need to make "Freezer Jam"
This jam is referred to as freezer jam because it isn't made in the traditional canning way- these jars of sweetness are perishable and thus have to be stored in your freezer not your pantry. When ready to use you take one out of the freezer and into the fridge- it will keep for about 3 weeks ((if it lasts that long!)) Click Here for the recipe I used. 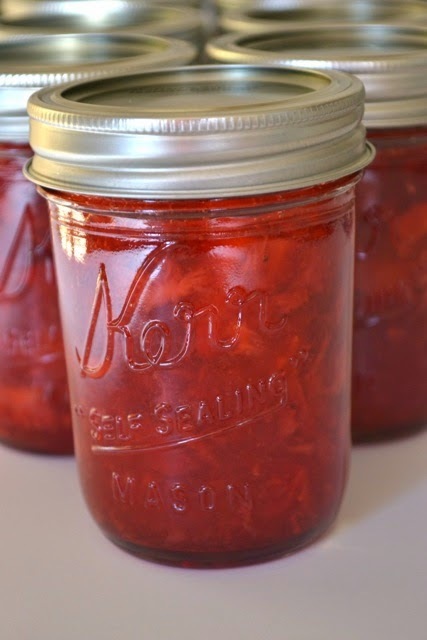 This jam is vibrant and sweet with an abundance of fresh fruit flavor. Enjoy! 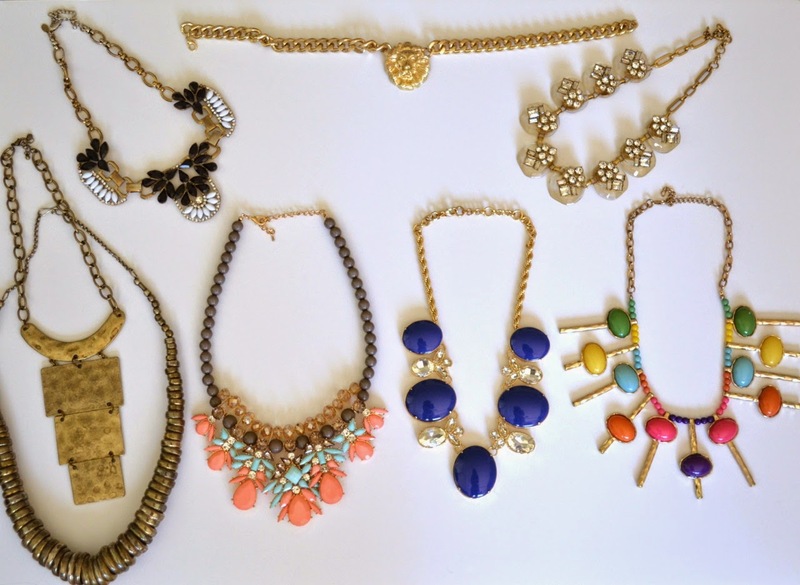 I have a collection of costume jewelry that ranges from boho to girly to pure glam and sometimes it's hard to keep it all organized. I'm a huge fan of being able to see my jewels, however with the overabundance of thrift store scores, gifts, and purchases here and there my collection has gotten a little too large. I adore the simplicity of being able to see it all displayed in acrylic boxes and necklace stands but my collection does not allow for that. 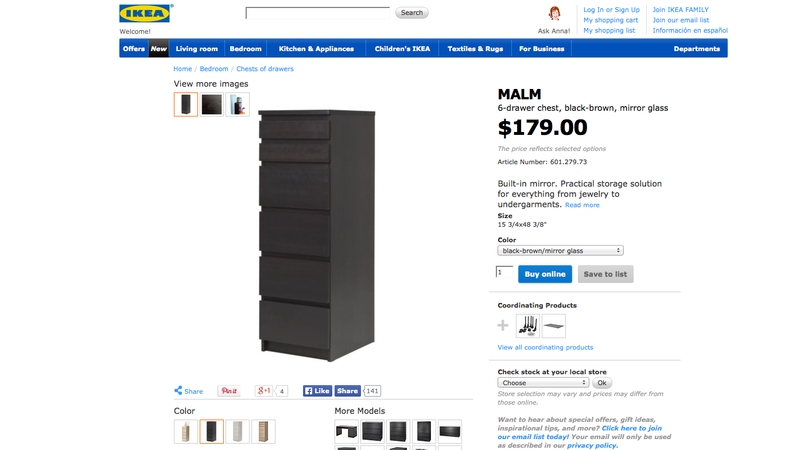 So, here is my solution for storing all the costume jewel baubles: The IKEA MALM Jewelry Chest! I don't utilize the top storage with the mirror- though I should. 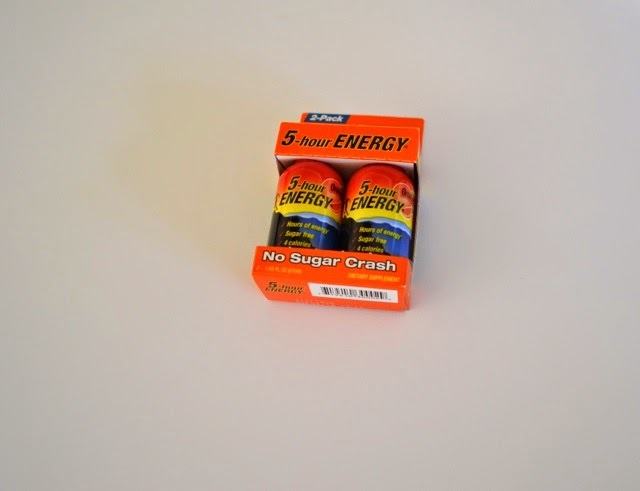 Maybe store empty boxes and pouches? For now the top has a cute pink box and a cutesy ring holder from target and my collection of body sprays. What do you use to store your baubles? 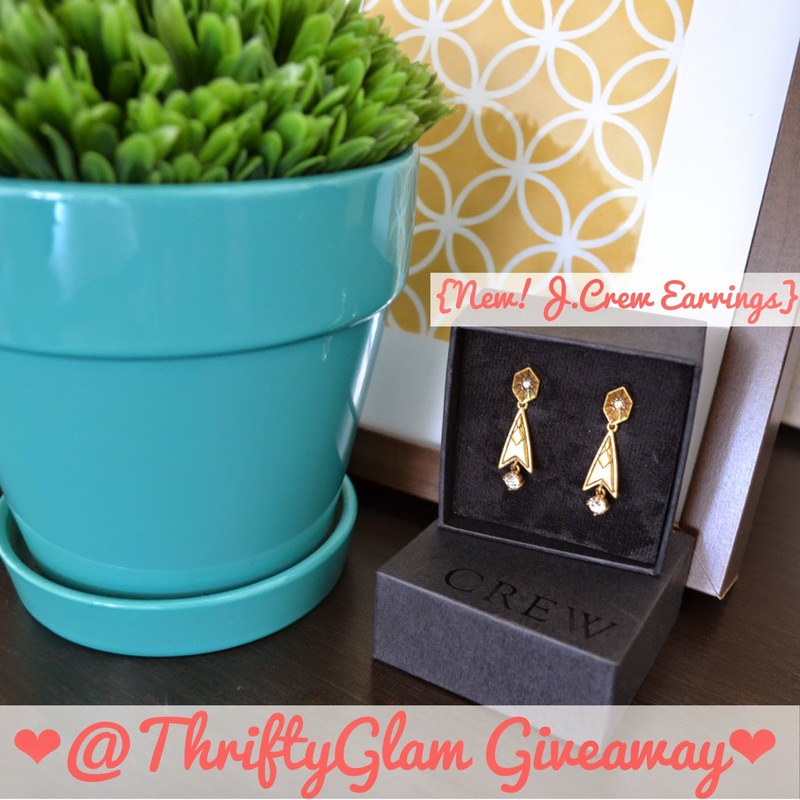 Psssst: Don't forget to enter my Instagram Giveaway to win these little beauties below! Tear, the bag is now sold out online! However, if you're really determined ring up your local Limited store and see if they can track one down for you (here are the details: Item# 1371322, Large Trapezoid Tote) Fingers Crossed! Outtake- This dog cracks me up! What style is your fave LBD to rock? A-Line? Sheath? Cocktail?